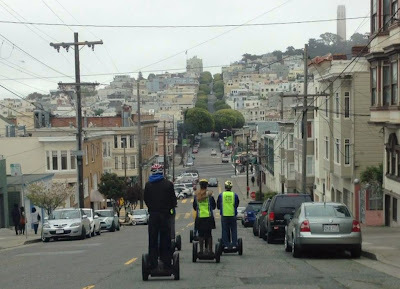 I thought it was neat to tour San Francisco on a Segway, but here, they are going down Lombard Street, the crookedest street in the world. Unfortunately, there was another vehicle ahead of me so I could not record them going downhill; but later, I caught up with them and recorded this video condensed from 2:30 minutes to 40 seconds. I hope you took your motion sickness pills. Interesting. I saw a tour group in San Antonio on Segways. Lots flatter in Texas though. I liked your video, especially where they all went through the stop signs together. What a cool way to tour without getting tired. What a fun way to explore a place, your video really brings it life too! How did you keep up with them?! Cool shots of the Segway tour. The Segways look like fun, but I could see me falling off. Happy Sunday! What an interesting view to see people being fun craving. We walked down Lombard street, a Segway would be high risk. From the comments, it sounds like Segways are popular and have made it around the world as a tool for tourists to be transported around. I would think they get a brief training on how to operated one, but going down Lombard St. seems to be reserved for the advanced group or the adventurous sorts. From following these group of Segway riders, yes, they did stop at various sites along the way, but unfortunately, I don't think they parked to go inside any locations. I guess have the fun is riding them through the San Francisco hills. I was a passenger so I was able to take the video; otherwise, I could not drive and operate a cell phone without getting a ticket. we almost did a segway tour of new orleans last november. i might think twice about sf with all its hills. looks like a fun and green way to travel around the city. Very cool segway video. I love riding them too.